Have you had enough rain this Spring? I have decided to stop cursing the rain and be one with it. Very Zen of me don’t you think? 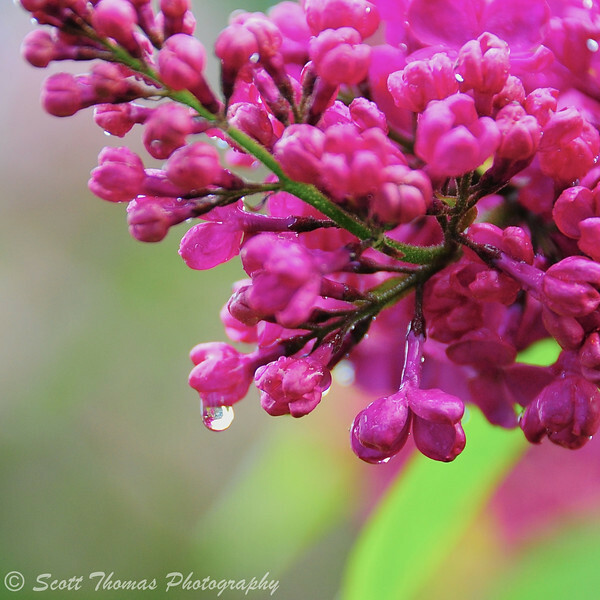 Wet conditions at the Lilac Festival in Rochester, New York. Nikon D700/28-300VR, 1/60s, f/5.6, ISO 800, EV 0, 230mm focal length. The challenges with shooting out in the rain are obvious. Keep the equipment from getting soaked. Cameras are light-tight so a little rain will not harm them. A down pour or long exposure to wet weather will so it is best to be prepared. While I am not a big fan of using a lens hood, they come in handy when it is raining. They stop the lens from accumulating water droplets which cause all kind of havoc when looking through the viewfinder. For keeping the rest of the camera dry, I recommend using inexpensive rainsleeves by Optech. 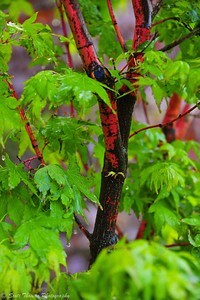 Coral bark Japanese maple at Highland Park in Rochester, New York during the Lilac Festival. Nikon D700/28-300VR, 1/60s, f/5.3, ISO 1600, EV 0, 112mm focal length. An advantage of photographing out in the rain or on cloudy days is the soft, even lighting coming from the sky. Colors are more vibrant and textures stand out. However, try and keep the overcast sky out of your photos as it is very bright by many stops than the subjects you are photographing on the ground. If you look at your LCD in blinky mode, the whole sky will be totally blown out and flashing If I do get some of the sky in, I tend to crop it out later. Water on surfaces is something you need to be aware of. Shiny surfaces cause highlights and reflections which are hard to deal with in photo editing. The use of a circular polarizing filter will remove them and give you even better and truer colors. Filters are easier to wipe off than most lenses as an added bonus. To see many of these tips in action, follow this link of a video by New England photographer Jerry Monkman. Like us, Jerry has been dealing with our wet Spring and shows us how to find peace with it. Enjoy. If you live in the United State, have a wonderful and safe holiday weekend! This entry was posted in Nature, Photography and tagged 28-300mm, bark, circular polarizer, coral, filter, green, japanese maple, jerry monkman, leaves, lilac festival, lilacs, new york, nikon D700, optech rainsleeves, rain, rochester, tips, trees, video, vr, wet. Bookmark the permalink. Thanks for this timely post – I’m headed to Watkins Glen this morning to shoot between the raindrops!! Of course I’ll let you know how it goes! Lucky you! I have to wait until tomorrow to get out and do some shooting. Hope it doesn’t rain too much. Thank you, Scott – this was very helpful to me. I’d figured out that I needed to get the sky out of there if I could, but I didn’t know why it was such a problem. Much to think about, even with a little camera that is perfectly happy to do all my thinking for me if I let it. Gerry, make it a habit to carry a plastic bag for your camera that can be sealed. My daughter lost her camera at an outdoor concert when it rained unexpectedly. Yes, when the sky is overcast, it is very bright. Avoid it if you can. I always keep a ziploc bag in my camera bag, just in case! (I use the freezer bags because they’re thicker than the storage bags). Another good use for them is in the winter…. when I’ve been outside on those rare snowy days, I seal the camera in the ziploc bag (get as much air out as possible) before going back inside, to help prevent condensation on and in the camera. Anyway… I don’t like the rain, but I love the rich colors after a rain shower. Forgot about the one, Michaela. Thanks for mentioning ziploc bags. I have one for my camera. My camera bag and lens pouches also have rain “jackets” that slip over them in a pinch. I’ve got a Ziploc bag attached to my camera bag that goes with me everywhere these days as downpours are to be expected, even when the sun makes an appearance (yesterday it was sunny in the front yard and raining in the back, three times… weird). I couldn’t figure out any other way to go out and about and feel safe about it. With the wild wind, an umbrella is not to be trusted and I’d rather not have to deal with that anyhow. The weather so far in 2011 has been anything but typical. Crossing my fingers it will calm down and the summer and fall will be worth all we are going through now. I love shooting in the rain, usually under an umbrella (sometimes carry two, a large one and a small one for use in wind). The light is so wonderful, the temperature is usually just great, and rain drops can be so interesting on flowers. I probably use every ploy possible for rainy days, preferring to wear a poncho which gives my camera gear good protection and I always (even on clear days) put my lenses in plastic bags before I stow them in my pack. The poncho idea is great, Terry! I got a few ponchos here from trips to Walt Disney World. Do you think I’d look strange in a bright yellow poncho with Mickey Mouse on the back? You wouldn’t look strange if you were with me. A couple days ago I had to use a bright orange poncho that I’ve kept in the console in the Jeep forever. And we are all looking for that, aren’t we, Consuelo? Photos in the rain – yours are lovely, but I hope you were able to get a taste of the sunshine we had this week too! Today is overcast yet again, but rain is not predicted. Said prior to the big storms this week. Whew! Hope that was the last batch of severe weather we see for a good long time! Wonderful lilac. And with the weather we have here these days, I’m afraid I will need some of your advices here! Spoken like a true Landscape photographer. The ones you have posted of storms coming are my favorites of you and Preston’s. I didn’t know about the rainsleeve, this will be great for the snow also, thanks. I never felt comfortable shooting in high ISO and recently had to for indoor and low lighting situation. It turns out that ISO 3200 is not so bad after all, it’s better to have some digital noise then not captured anything at all. The rainsleeves are a bargain. There more expensive ones which last a long time but unless you are constantly in the elements, the cheap ones are fine. Check out noise reducing software for your high ISO photos. Good investment. I use Noise Ninja but there are others. Most can be tried out for 30 days for free.